I mentioned how much this irked me. And over on MixingLight.com, in our podcast about the things that annoyed us in Resolve 12, both Dan Moran and I were vocal about this change of behavior—which is very different from all previous versions of DaVinci Resolve. In fact, I surprised myself by how strongly I felt that Resolve 12’s new behavior was completely messing up my long-established workflows. I made heavy use of how Resolve separated folder structures for Media vs. Timelines. When you enable this option, in the Media Pool and on the Edit Page, a brand new folder appears that IS NOT a Smart Bin! When ‘Use Timelines Bin’ in enabled, a new ‘Timelines’ folder is revealed. Resolve automatically sorts Timelines in this folder, keeping them separate from Media! This option forces all Timelines to ONLY appear in the Timelines folder (or subfolders). And Media will only appear on the ‘Master’ folder (or subfolders). When is this option super-useful? Once you enable ‘Timeline Bins’ you can create an entire folder structure to drag and drop timelines. You can’t enable the ‘Use Timelines Bin’ setting if you have already created ANY timelines. You can enable this option if there’s media in the Media Pool but once a timeline is created, you can’t decide to enable (or disable) that setting without deleting all timelines in the project. In truth – this doesn’t bother me at all. But if I could ask for one feature enhancement? It would be to make this feature enabled as DEFAULT. After all, this is how previous versions of Resolve have worked. And it’s a behavior that FCPX has semi-adopted and all the other NLEs *should* adopt. Timelines are NOT media. Timelines are Metadata and should always be isolated from media and deciding to co-mingle timelines and media should be an optional behavior. Still, a HUGE shout-out to Team DaVinci Resolve for listening and implementing this behavior! Thanks! I’m not a big fan of how DaVinci Resolve 12 Beta co-mingles Timelines and Media within folders. In previous versions, Timelines were segregated from Media files, making it super-easy to find and organize timelines separately from Media. Prior to DaVinci Resolve 12 Beta, if you imported an XML, the Media files would go into the Media Pool while the associated timeline would end up in its own ‘Timelines’ window. This makes total and complete sense. Resolve just naturally helped me keep my projects organized. 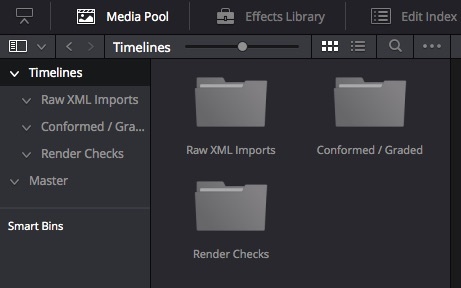 In Resolve 12 Public Beta, now the imported timeline gets dropped into the Media Pool (never mind the cognitive dissonance of dropping Timelines into the Media Pool) – the imported timeline also gets dropped into the same folder as the imported Media. If you’ve got clients who send you up to 15 timelines to color grade (as I do) and if you like to segregate the imported Media into unique per-timeline folders (as I do), then you’ve now got 15 timelines scattered throughout 15 folders in your Media Pool. Using the options shown below, you can create your own ‘Timelines’ Smart Bin. But doing this every day, for every project, is mostly tedious. It’s just One. More. Thing. To. Do. before starting your session. The ‘Create Smart Bins’ dialog box with options selected to create a ‘timeline smart bin’. In Project Settings, click into the ‘General’ section and in the UI Settings submenu, look for the ‘Create Smart Bin for Timelines’ option. After enabling the checkbox, a new ‘Timelines Smart Bin’ is automatically created. Now, every timeline scattered across your entire Media Pool will be listed here. While I still prefer the pre-Resolve 12 behavior, manually creating a Timeline Smart Bin is tedious enough that I’m calling this workaround a ‘Little Gem’. What’s one of the fun things when working in a brand new, completely updated version of the software you use professionally? Why, discovering all the little features that didn’t make it into the marketing material! That’s what this little series is about. As I discover nifty stuff about Resolve 12, I’ll point them out right here in this Little Gems series. 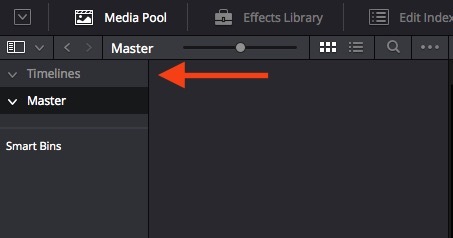 A new command in DaVinci Resolve 12: Click-drag+Option to reveal the ‘neutral line’ and snap your control point to it. With a point selected, and while option-dragging, a line pops up showing you the neutral centerline. Keep dragging and the point will SNAP to neutral! Let go of the option key to make a slight move off the neutral line. No more second-guessing yourself. One of my favorite Little Gems so far in DaVinci Resolve 12. What do I mean by that? Notice in this next screenshot how I’ve got two long clips on Tracks V3 & V4… they’re the same full frame black .jpg, cropped to create a letterbox. Notice how all four tracks are active. Also notice Shots 1 and 2 are the full-frame black overlays for letterboxing. Also notice how the black JPEGs are also shots 1 & 2 in our thumbnail timeline. 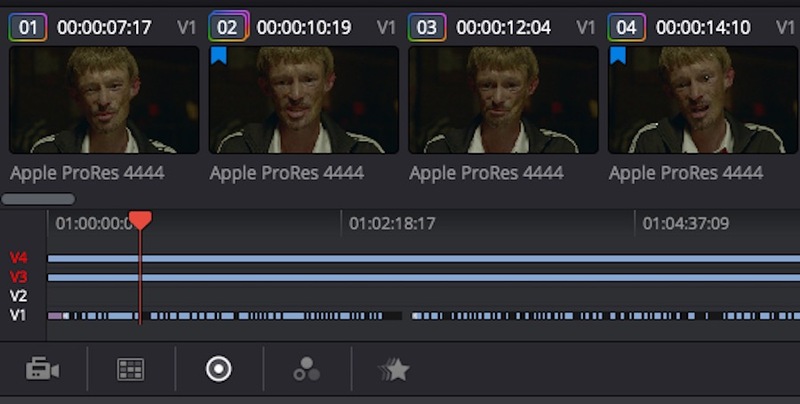 Why have we used these JPEGs instead of Resolve’s built-in letterboxing tools? This makes masking with Resolve’s built-in toolset a little tricky and using top-level tracks just for letterboxing makes a ton of sense. But there’s a problem and it was posted on Blackmagic’s DaVinci Resolve forum a few days after the launch of DaVinci Resolve 12 Public Beta 1. The trouble is, when I’m grading the clips on track V1, and I pause playback, the clip on V5 gets selected, so then the up and down arrow keys cause the playhead to jump far away from where I was working. If you’ve color graded more than a handful of jobs on DaVinci Resolve, you know precisely what Elliott is experiencing. Basically… every time he pauses playback, Resolve re-selects those top-level shots as the active shots. If he up- or down- arrows, he jumps to the first or last frame of those shots. In a 30 minute sequence, that’s a major annoyance. Before DaVinci Resolve 12, the only way to solve this navigation problem was to turn those top-level tracks off, hiding the letterboxing. And if you’ve ever graded a project that was shot full frame but protected for the letterbox, you know your color grading decisions change if that letterbox is turned off vs turned on. There is a new feature in v12. On the color page, hold option key and select the track number on the far [Left Hand Side] of the track that you wish to be ignored for transport selection. The track number is red when in this mode. This will hide items on this track from the thumbnails but when the CTI is over those clips you will still see their impact on the viewer. Ideal for mattes, grain, titles, etc. Little Gem #2: After option-clicking on Tracks 3 & 4, they turn red. The tracks are active but ignored for timeline navigation purposes while in the Color Page. Notice how they’ve disappeared from the thumbnail navigation, no longer labeled as Shots 1 & 2. Now you can have overlays spanning entire timelines, keep them active for color grading decision-making and never have them get in the way of navigating the timeline on the Color page.